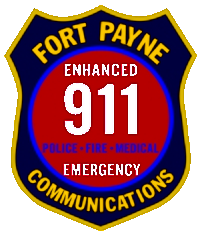 All 9-1-1 addresses for the City of Fort Payne are assigned by the 9-1-1 Communications Department. We are proud to have an enhanced 9-1-1 system in the City of Fort Payne. With this system, as with all enhanced 9-1-1 systems, as soon as you dial the emergency number “9 1 1” and the call connects, we have your location information even if the connection is lost. Therefore, it is imperative that your information be correct and initially assigned by us. When connecting your phone service, the phone company will ask that you give a valid 9-1-1 address for the residence the phone will be located in. It is very important the address given is correct as the phone company is responsible for routing a 9-1-1 call from your location to our facility. We will still ask you to verify your address if you place a 9-1-1 call even though it appears on our display. We know the address of the phone used to dial 9-1-1 but we want to make sure the address is correct and that the problem you are calling about is actually at this address. Each home and business in the City of Fort Payne should have a 9-1-1 address. Except under certain circumstances, when you relocate into an existing home or business the address for that home or business does not change. If the person you buy or rent from does not know the address, call our business office at 845-1272. In most cases we can give you your correct address over the phone if you know the names or addresses of your new neighbors and the correct road name and/or parcel number. If you would like to stop by our office to provide the information or to get assistance we are located at 200 Gault Av S in the old City Hall building that now houses the Police Department and 9-1-1. 9-1-1 addresses are not limited to just homes and businesses. If a structure requires a telephone line connection, electrical power connection or simply if an address is required for insurance purposes we can provide a 9-1-1 address. Due to the numerous addresses that could exist per a large area of vacant property we do not provide permanent addresses for open land or property. We can provide a general reference address in these cases but it will not be kept on file and if it were ever used for a valid structure, it is subject to being changed by our office. Multiple structures, even on the same property, require a unique individual address. Name of the person who this address will be assigned to and your name if you are an agent for this party. Phone number to contact you with any questions and to inform you of your address. Name of the road this address will be located on. Description of any structures already standing or nearby landmarks. Tax parcel number including lot number if applicable. Approximate distance to nearest neighboring structures. Once you have received your 9-1-1 address we encourage that it be posted at your driveway, on both sides of your mailbox or on an address marker, so emergency responders are able to read the address from the roadway traveling in either direction. We also encourage that your address number be posted on your home. Numbers used on your structure, marker or mailbox should be large enough to be easily seen from the road and visible at night. Remember, in an emergency there is no time to waste, please make your home easy to locate!